I was going through some old photos and was reminded of a simply amazing experience that I wanted to share with you. On Saturday morning, as I climbed into seat 3D on the flight from Richmond to Atlanta, I barely glanced at my seatmate. My seatmate graciously agreed to meet his fans. After he left, I asked the gentleman across the aisle from me if he knew who Mr. Franco was and why he was famous. 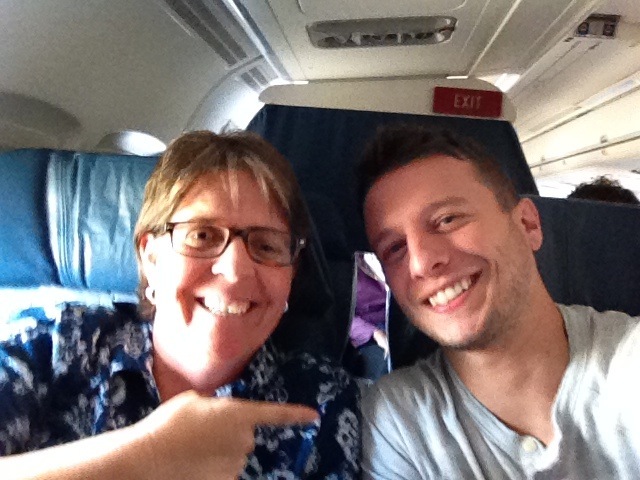 It turns out that I was sitting next to Mat Franco, the first magician to win America’s Got Talent. When Mat returned to his seat, I admitted that I didn’t watch TV and didn’t know who he was but I offered my congratulations on his accomplishment. He smiled, said thank you and we started talking. Now, you might think we talked about fame and his plans and how he does his tricks. In fact, we discussed marketing, how to get clients and how to grow a business. At one point in our talk, I mentioned to Mat that I had a theory about businesses – that they are either light bulbs or laser beams. His face lit up when I said that laser beams are just light bulbs that found their focus. Mat told me that he had his own laser beam moment a few years ago. He was working hard to book gigs for his general magic show and it was tough going. That is until he decided to focus on doing card illusions. He dropped all the tricks from his repertoire except cards and became a card specialist. According to Mat, from that moment on, he started getting bookings at colleges across the country. He said that laser beam focus is what allowed him to win America’s Got Talent. Because Mat needed to use cards as his focal point, he forced himself to come up with more and more creative illusions. In the trick that he is proudest of, he finds the host’s cell phone inside an audience member’s seat cushion. Mat says the real power of the moment is when it is revealed that the seat number is the same as the numbers on the cards drawn earlier by another judge. If choosing to focus and eliminate distractions and wasted efforts can turn a magician into a national talent contest winner (and recipient of $1,000,000 prize! ), imagine what it can do for your business. What are you going to focus on this week? This month? This year? And what are you going to stop doing so you can devote more time to become a laser beam? In a strange twist of fate, a choice I made that day put me in the seat next to Mat. My original seat that day was 4D. However, I don’t like sitting in the last row so I changed my seat that day. To make it even stranger, Mat was originally assigned to 1C that morning but moved to 3C because he doesn’t like the bulkhead row. Yes, Mat is as sweet in person as he appeared to be on the show. No, I didn’t ask him to do any magic for me.